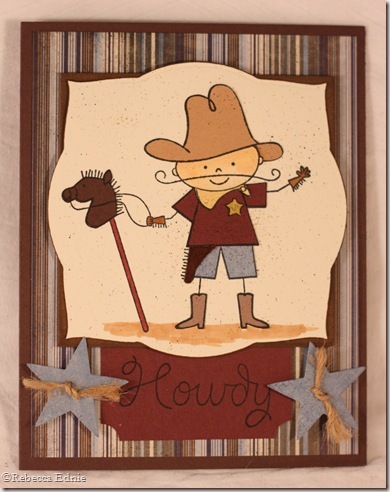 Cowboy Howdy for Whimsical Wednesdays! I couldn’t decide what to do for this week’s challenge. I was sitting there stuck, Jameson decided to help me out. “Why don’t you use the Cowboy set mom?” Sure kiddo, good idea! I’d been making kid and baby cards all afternoon so continuing the theme seemed to work! Smart kid! Thanks Jameson. I paper pieced this little Sherriff using cardstock and patterned paper. Oh, except the holster, it is pieced with faux suede ribbon! Fun huh? His face is coloured with Copics and the whole panel is flyspecked using a SU! colour spritzer. The stars were cut from a Sizzix die and I used DP rather than cardstock. so when I came up with the button holes idea, I was worried that when I tied the twine, it might cut through the paper. So I reinforced the back with chipboard, just between the holes. This fabulous sketch is from Nicky this week. I like where he put the sentiment panel! I hope you will all play this week’s sketch challenge. And don’t forget to post your creation using DDCS9 (not 09) and link back to the Whimsical Wednesdays blog so we can all see your work. Be sure to visit all of the DareDevils and see their FABULOUS cards. So much talent on this team!! I have no idea who is or isn’t playing yet because I am writing this Sunday night. I hope all is well with everyone and all can play. Rebecca, how are you ? Hope you are well!! I LOVE this card!!! What a SUPER image and what a SUPER job you did with it!! Those stars ROCK!! !Take care!Jacquie/Javablustamper! You did such a great job with the sketch. This is so fun. So cute! I love what you did with the sketch! And, those stars with the twine are perfect!! I love that idea! Howdy partner! Yer got yerself a fine lookin' card there missy! 🙂 LOL A very sweet take on this week's sketch Rebecca. I love this card! 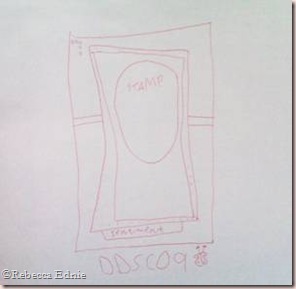 You did an awesome job with the sketch – and you did a great job cutting the shape. And such a fun little cowboy there! I like the stars too.